Rev Tom Telfer was inducted as Minister of Kilchrenan and Dalavich linked with Muckairn in Taynuilt church on Thursday 22nd March. Rev Thomas William Telfer, BA, MDiv, is the former minister of Pioneer United Methodist Church, Walla Walla and a member of the Pacific Northwest Annual Conference of the United Methodist Church, and has received a Certificate of Eligibility granted under Act IX 2002 of the Church of Scotland. He has come to Argyll Presbytery after a period of familiarisation with the Church of Scotland in Duns Presbytery. 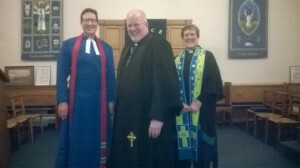 The photo shows Tom with Rev Dugald Cameron, Moderator of Presbytery (left), who conducted the service, and Rev Chris Fulcher (right), who preached on Psalm 84 and Acts 2: 44-47.